Of all the gorgeous communities that can be found in Southwest Florida, few are better known and more highly regarded than Bonita Bay in Bonita Springs. This gorgeous community truly sets the bar for high quality standards in Southwest Florida real estate, winning countless awards since virtually its inception in the 1980’s. 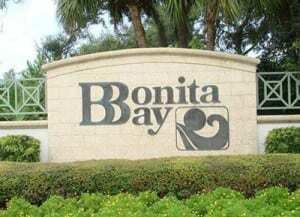 But what makes Bonita Bay stand out among all the other stunning gated communities in Southwest Florida? Bonita Bay is truly a sight to behold, blending in perfectly with the local landscape – of which so little is disturbed in order to keep the community looking as natural as possible. Bald eagles, reptiles, otters, deer, and birds and fish of every variety imaginable are just a few of the native critters that you share an environment with in Bonita Bay. In fact, of the 2,400 lush acres that make up the community of Bonita Bay, more than 1,400 of them are devoted to nature. This community was truly designed with environmental stewardship in mind, and you can see it everywhere from the community’s hundreds of lakes to its many scenic open spaces and waterfront parks. This is also one community that was designed with an active lifestyle in mind. At the member-owned Bonita Bay Club, you can play golf or tennis, as well as stay fit in the state of the art fitness center and spa. If you’d rather be outside, make use of any of the miles of walking trails that meander throughout the community and its preserves, perfect for running or biking. At Bonita Bay, your life was meant to be integrated with the nature all around you. Perhaps the true star of Bonita Bay, however, is the Bonita Bay Marina, an onsite marina where residents can house their boats. With a home in Bonita Bay, the Imperial River and Gulf of Mexico are at your fingertips, perfect for boating, fishing, or simply relaxing on the water any time the mood strikes. Afterwards, you can always relax and enjoy the scenery at the marina’s waterfront restaurant, or head back to the Bonita Bay clubhouse and enjoy dinner at any of several world class options. One thing that makes Bonita Bay especially unique is its resident clubs, which are available in anything from regional home state clubs like the Michigan Club or Kentucky Club, to hobby-focused clubs like Garden Club and Nature Club. There’s even a few sports-centered clubs, like Bicycle Club and Fishing Club, for those looking to stay in shape or enjoy a little friendly competition, or to simply get in as much time outside as possible. Whether or not you choose to join any of the community’s many social clubs, Bonita Bay is designed to feel like home right from the start. To browse the best Bonita Bay homes for sale, as well as other Naples, Cape Coral, Fort Myers, or Bonita Springs real estate, contact Dave and Brenda of Sage Realtor Group by calling (239) 896-8549 today.